* Annual estimated passenger usage based on sales of tickets in stated financial year(s) which end or originate at Bere Ferrers from Office of Rail and Road statistics. Methodology may vary year on year. 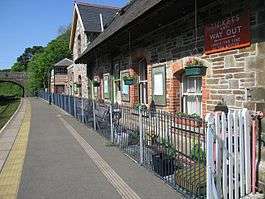 Bere Ferrers station on the Tamar Valley Line is situated near the village of Bere Ferrers in Devon, England. The station is on the former Southern main line between Exeter and Plymouth via Okehampton. It is currently operated by Great Western Railway (GWR). The Plymouth, Devonport and South Western Junction Railway opened the station on 2 June 1890 with its main line from Lydford to Devonport, which gave the London and South Western Railway a route into Plymouth that was independent of the Great Western Railway. The station was originally called Beer Ferris after the local Beer family who owned several nearby villages. However, in 1897, the railway authorities of the time decided that this name promoted an unrefined image of the village due to the association with beer, and therefore changed the name to Bere Ferrers. The original spelling can still be seen on the sign on the old signal box, which as of 2006 is being converted into a small railway museum. The signal box, while an LSWR original, is quite new to the site having been erected in 1989/90 – it was formerly at Pinhoe railway station on the outskirts of Exeter. Through services from Lydford were withdrawn on 6 May 1968 and the line reduced to a single track on 7 September 1970. The station was the scene of a fatal railway accident on 24 September 1917. Ten soldiers from New Zealand were being transported from Plymouth to Salisbury following their arrival in Britain. At Bere Ferrers station they alighted from their troop train for a brief rest (on the wrong side of the train, between the tracks) and, being unaccustomed to British railways, were struck and killed by an oncoming express. The men are buried in a Plymouth war cemetery, and a plaque was unveiled in 2001 in their memory in the village centre. Bere Ferrers is served by GWR trains on the Tamar Valley Line from Gunnislake to Plymouth. Connections with main line services can be made at Plymouth, although a small number of Tamar Valley services continue beyond Plymouth. The railway from Plymouth to Gunnislake is designated as a community railway and is supported by marketing provided by the Devon and Cornwall Rail Partnership. The line is promoted under the "Tamar Valley Line" name. The Olde Plough Inn takes part in the Tamar Valley Line rail ale trail, which is designed to promote the use of the line. The line is also part of the Dartmoor Sunday Rover network of integrated bus and rail routes. ↑ "Memorial Unveiled for Kiwi Soldiers". BBC Devon News. 2001. Retrieved 2007-11-26. ↑ "Bere Ferrers Station Accident-1917". Waymarking.com. Retrieved 31 May 2010. Cheesman, AJ (1967). The Plymouth, Devonport and South Western Junction Railway. Blandford Forum: Oakwood Press. Clinker, CR (1963). The Railways of Cornwall 1809 - 1963. Dawlish: David and Charles. The Tamar Belle, a visitor centre based in the old station building.